PUBLIC MEETING re: 6-8-10 ANN STREET: Tues. September 8 @ 7:00 pm at the Planning and Development Committee (PDC) in City Hall (Council Chamber). ► Click for Agenda + 28p Planning Information Report (Item 4.1). ► Novae Res Urbis article (January 29, 2014): Power Shift: OMB denies Port Credit appeal (excerpt from publication). 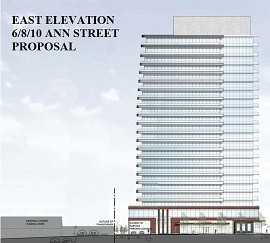 OMB DECISION RELEASED: (January 17, 2014; online as of Jan 20) - The FRAM development application for a non-conforming 22-storey condo at 6-8-10 Ann Street (on the half-block above the mainstreet funeral home) in the heart of Port Credit has been DENIED at the OMB. ► Click to view the 22p Official Decision in PDF or Word format. Excerpt: " The Board finds that the proposal does not achieve the overall intent, goals, objectives and specific policies of Mississauga Official Plan or policies of either Mississauga Plan or of the Area Plan. The proposal is of a height, scale, massing and density that is excessive for the site and does not provide an adequate height transition to adjacent low-rise buildings. The proposed development does not represent good land use planning and is not in the public interest. If approved, it would serve to erode the Port Credit Village character by undermining the policy direction that the City has set for this unique neighbourhood and set a disruptive precedent for similar development proposals." 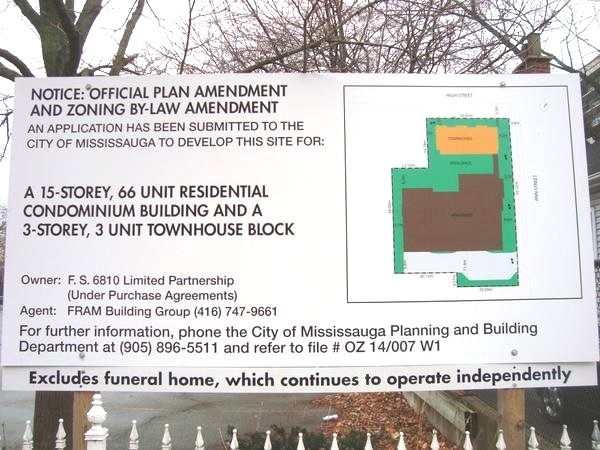 APPLICANT HAS GONE TO THE OMB: (Filed February 21, 2013) - The FRAM development application for a non-conforming 22-storey condo at 6-8-10 Ann Street (on the half-block above the mainstreet funeral home) in the heart of Port Credit will be decided at the Ontario Municipal Board (OMB). The Pre-Hearing Conference took place June 19, 2013. Case #PL130153. TOPCA IS REGISTERED AS A PARTICIPANT. The 10-day Hearing will begin on Monday, November 25, 2013. NOTE: See our Deputation on December 3, 2012 at the Planning and Development Committee, which formed the basis for our presentation at the OMB on November 25, 2013; Posted below. PUBLIC MEETING: Monday, June 24, 2013	@ 6:00 p.m. at CITY HALL in the Council Chamber, Planning & Development Committee (PDC). Click for AGENDA (very large and may take time to load -- Report starts p383). TOPCA DEPUTATION TO COUNCIL (PDC): December 3, 2012. ► Click image for enlargement of Slide #31 from the deputation. PUBLIC MEETING: Monday, December 3, 2012 at CITY HALL in the Council Chamber, Planning & Development Committee (PDC). 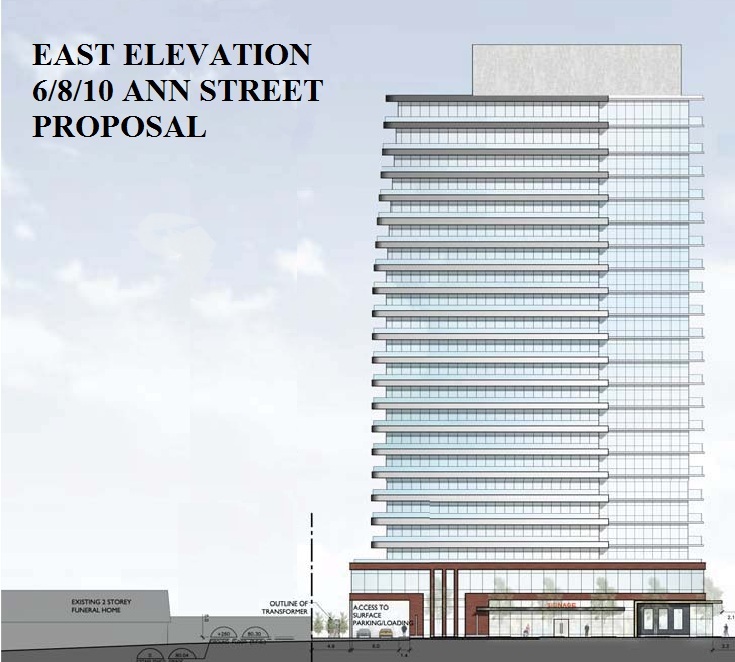 FRAM Building Group has made an application to redevelop the site at 6-8-10 Ann Street to include a 22-storey condominium residence with 140 units, ground level retail and second floor commercial / office use. 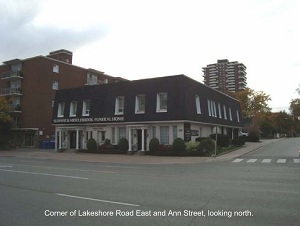 This is the portion of the block immediately behind (north of) the Skinner & Middlebrook Funeral Home located at	128 Lakeshore Road East (satellite map). ► Click to view PERSPECTIVES ALBUM (6p PDF) dated Nov. 23, 2012. ► Click to view the INFORMATION REPORT prepared by Planning Staff concerning this application (38p PDF). 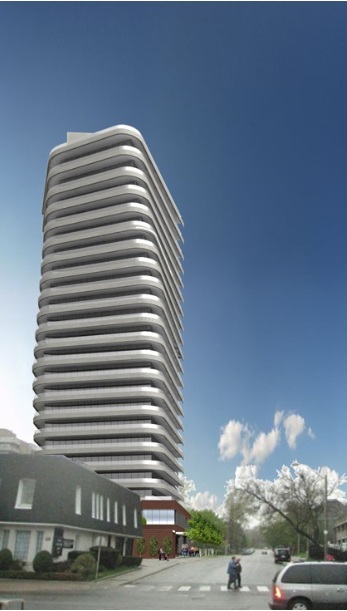 ► Click for visuals of the proposed building provided by FRAM (April 4, 2011). The proposed condo building would occupy the area of the present attached residence at #6 Ann Street (with swimming pool) behind the Funeral Home and the adjacent parking lot at #8 Ann Street. In addition, the property on the NE corner of the block (house at #10 Ann Street at High Street) is included in the proposed redevelopment. 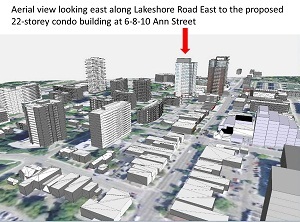 The present District Policies allow a maximum of 15 storeys, half a block back from Lakeshore Road, subject to various urban design parameters. THE FUNERAL HOME PLANS TO STAY with parking potentially under the new building. ► Click for FRAM's Concept Presentation: December 13, 2011 (32p PDF). 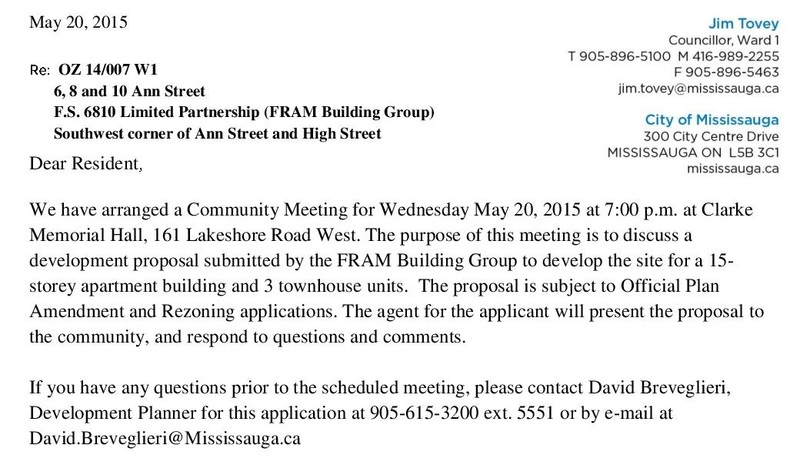 COMMUNITY MEETING: Wednesday, March 21 @ 7-9 p.m. at CLARKE HALL, 161 Lakeshore Road West (map). Hosted by Ward 1 Councillor Jim Tovey to discuss the proposal. ALL ARE WELCOME. ► Click for the MEETING NOTICE. ► Mississauga News article (March 21, 2012): Residents discuss Port Credit condo. 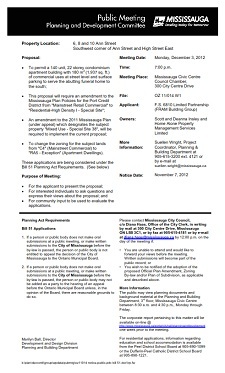 ► Notice of Complete Application (click to view) was issued on Nov. 25, 2011, for the Official Plan amendment and rezoning applications located at 6-8-10 Ann Street, known as file OZ 11/014 W1. ► Click to view	PHOTO ALBUM (22p PDF) of the present site. 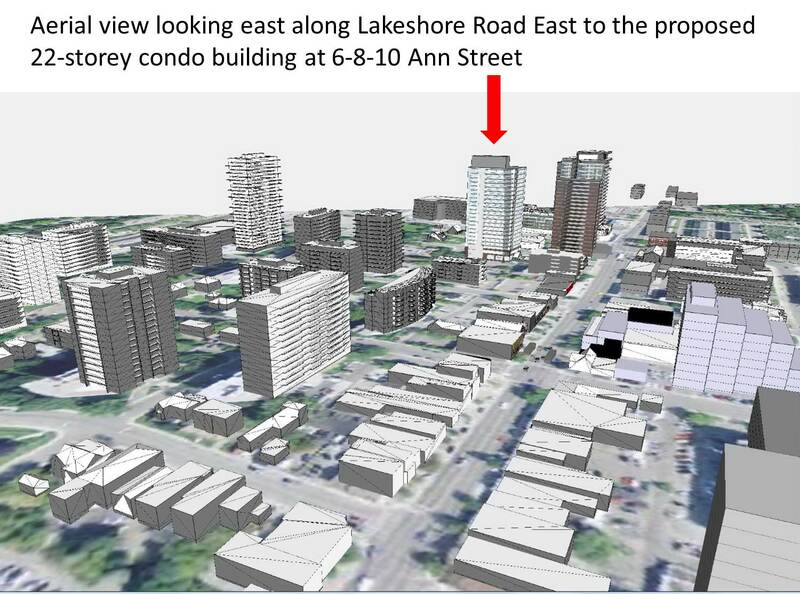 ► TOUR THE AREA: Starting from the Google Maps view of the Skinner & Middlebrook building, go to views of the proposed condo site presently occupied by the house in rear and then the parking lot and house @ 10 Ann Street. 128 Lakeshore Road East (satellite map). "The goal of the Committee is to take the comments received at the workshops, conclude on the design principles and formulate a general design direction for the development proposal to the City. Participation on the Committee will require attendance at up to three (3) meetings and a willingness to work with the group on the design of a building between 19 to 22 storeys in height." 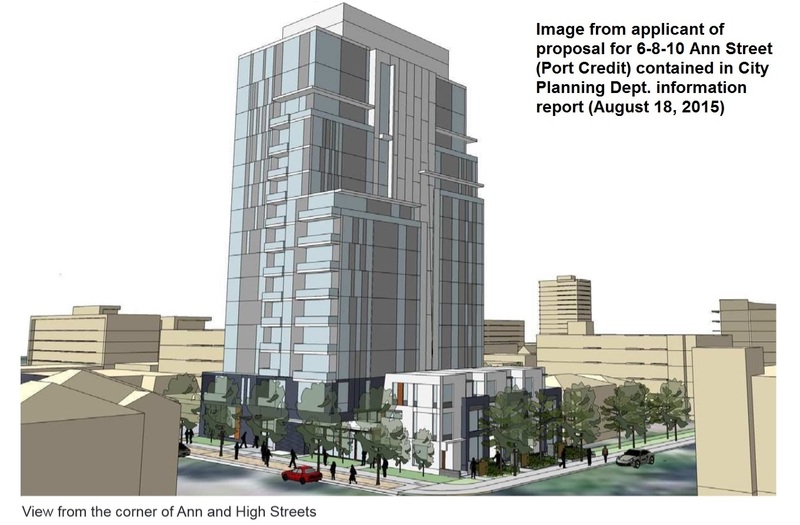 "We understand from comments made by Planning Staff that 15 storeys on the site is not a given, but the maximum allowable, conditional on a variety of stated urban design criteria. As a residents' association, we would not presume to forgo the planning principles involved, nor pre-empt the future public process, by supporting the concept of a 19-22 storey building where a building of half that height and proposed density might prove to be most appropriate." ► FRAM WORKSHOPS: Four (4) workshops were hosted by FRAM at the WATERSIDE INN on January 15, 18, 25 and February 1, 2011. FRAM originally issued an invitation to the group reps who sit on the Port Credit Local Advisory Panel to attend a series of workshops about the project. Councillor Jim Tovey acted on concerns by the reps that the workshops should be open and FRAM's invitation was subsequently been expanded to include the neighbouring properties, the various community constituencies and the Councillor and City Planning Staff. ► PLANNING STAFF INVOLVEMENT: City staff attended all the workshops, and further to requests by the citizen reps of TOPCA, CRA, PCVP, FOPCV and VIVA PC, Planning Staff made a presentation at the beginning of the first session about the City's DRAFT Port Credit Built Form Guidelines (click to view), including proposed heights, transitions, setbacks, shadowing, etc. "At the invitation of Frank Giannone, staff from the Planning and Building Department (both Policy and Development & Design Sections) will be attending the FRAM/Slokker workshops. We are always interested in helping the community understand and appreciate the issues and complexity that can sometimes occur when dealing with planning and development. "I think it is important to state upfront that City staff are attending as more of a resource to answer questions about our current regulations and policies. We can also provide our thoughts behind the material included in the Draft Built Form Guidelines Presentation and other planning initiatives (e.g. mobility hubs) that the City is involved with. Staff may on occasion ask questions or offer a suggestion for the workshop participants to consider and discuss, after all, as planners we do like to talk about planning matters. "However I want to be clear that the workshops are not a substitute for the process that the City uses to evaluate development applications. Should an application be made by FRAM on the Ann Street property it would follow the development approval process established by the City and governed through the Planning Act. Although staff will attend the workshops to listen to the discussions it is important to recognize that any final product that results from the workshops will not be endorsed by City staff. "Please note that the material in the Draft Built Form Guidelines Presentation are draft, and that they have not been approved by Council. As such, elements of the Design Guidelines may still change, however, the Draft Guidelines provide a reasonable idea of the direction for these lands." E-mail your comments to Ward 1 Councillor Jim Tovey. Please consider copying TOPCA@topca.net so that the TOPCA Executive can best represent the community's views to the City when taking a formal position. ► The Planner of Record for the City is Ben Phillips (905) 615-3200 x5751.